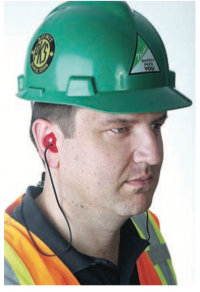 Effective hearing protection should be comfortable, effective, and yet still enable people to talk to one another. Custom Protect Ear’s hearing protection devices are made of a medical-grade silicone, and they are designed to be soft and flexible. The advantage of the softer devices is better comfort and function. They change shape slightly as the wearer ’s ear canal changes shape when talking or chew ing, thereby continuing to seal during those activities. Including a filter and vent in custom ear protectors like Custom Protect Ear ’s can make speech more understandable by reducing attenuation at higher speech frequencies. This allows them to be left in while talking, and isn’t possible with typical solid foam earplugs.